Oh, how beautiful the world would be if there were no chores. But unfortunately cleaning your coffee maker is one of them. If you live in an area with hard water, it is only a matter of time before you notice the chalky film called limescale inside your machine. While it is probably not dangerous for your health, it can and will damage your coffee maker in the long-run when you don’t take action and clean your machine frequently, at least once a month. And just because you think you live somewhere where there is no hard water does not mean that you are off the hook. You may also think washing off the leftovers from the removable parts does the trick. No, that is not enough! There are a lot of areas, gaps, and holes inside the machine, which you probably never see. And the residues of oils (the oils inside the beans) in the coffee maker becomes rancid and deteriorate the flavor of all future brews. The best coffee maker cannot produce good coffee without frequent cleaning! So put on your rubber gloves, pick up your scrubber and get dirty! I see you are still here that means you are serious about it. For now, I would suggest you take off those gloves because I may have exaggerated a little bit. You don’t’ get that dirty. My plan is to show you a few different ways to get your machine neat as a pin again. At first, I show you the steps how to clean your coffee maker with vinegar and then without. I will also reveal some tricks about how to remove this stubborn burnt coffee inside the glass carafe. And last but not least I want to provide you with some coffee cleaners that you can buy in the store. Use the same mixture again and repeat step 3 and 4. If you don’t like to use vinegar or have experienced a strong aftertaste in your coffee you may want to try food-grade citr﻿ic acid. Here the steps to get your coffee machine spotless again. If the above steps do not lead to the desired results increase the dosage of the citric acid and repeat the process with a fresh mix. 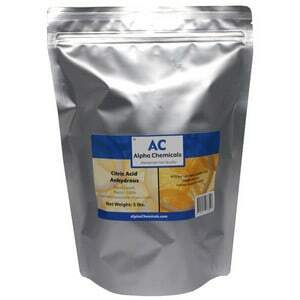 Don’t use the old water and citric acid solution more than one time! Let’s recap what we know about cleaning your coffee maker. As I mentioned before, I will forward you some tricks that a cleaning lady revealed to me when I used to live in a company apartment. It’s a long time ago so I hope I can remember all the details how to remove the burned coffee in the pot. Throw a few cents inside the pot and fill it up with about a tablespoon of vinegar. Let it sit there and every other minute just swirl it and enjoy the magic. Obviously, the vinegar loosens all the coffee and the coins rub it off. Squeeze a lemon or two. Fill the coffee pot with crushed ice and add a tablespoon of salt. Pour the lemon juice into the pot, wait for the ice to melt, swirl around and enjoy the magic. Bleach as a more traditional way works as well. Just add some of it to the pot and swirl. The burned coffee will loosen quickly and can then be rubbed off in the sink. It is important that you clean out the carafe very thoroughly to not miss any spots and then have the bleach odor in your coffee. This is an awesome cleaner that dissolves and removes all the residues we have talked about before like coffee bean oils and lime scale with only one cycle. If you like it simple and convenient, do not look any further! And yes, my link to the ‘Pack of 8’ is on purpose. Because if you look at the picture carefully you see that it is only a 7 fluid ounces bottle. 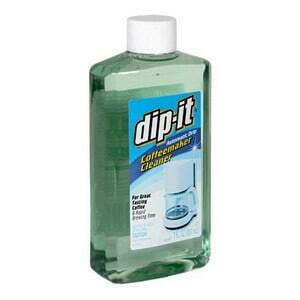 So don’t let the picture confuse you because to me it looked like a regular sized dish soap bottle at first. For every cleaning cycle, you will fill up the pot with half of a bottle. And who says you can only use it for your drip coffee machine. You can also clean your water cooker or the kettle with this product. As an alternative, I would recommend you Mr. Coffee Coffeemaker Cleaner for all automatic drip coffee makers. As you can see you have different options how to clean your coffee machine. It is just important that you really do it at least once a month, if not for yourself than for the sake of your coffee. So how do you clean your coffee maker? Do you have any other tricks or hints? Please share them here with me.